The two important major elements of Ayushman Bharat PM Jan Arogya Yojana are elements-National Health Protection Scheme and Wellness centres. Its will Provide paperless and cashless treatment & primary care to patients. Ayushman Bharat PM Jan Arogya Yojana or National Health Protection Scheme would be cover 10 Crore rural and urban families and Insurance Cover up to 5 Lakh Per Family Per Year. There will be no restriction on the size of the family Age or Gender to claim the insurance for treatment. To apply for Ayushman Bharat PM Jan Arogya Yojana or National Health Protection Scheme, there is No Need for Registration and also never fill up any type of registration application form to claim treatment insurance. No special card will be required for treatment, just beneficiary will have proper or govt issued identity. Department will directly dispatch letters to candidates of ayushman bharat scheme. The treatment will be fully cashless. There is no pre-condition for treatment and people can get health benefits only through a single prescribed ID. People can get treatment in any public / private / private empaneled hospitals. Beneficiaries no need to pay any money for the treatment in case of hospitalization. The Ayushman Bharat PMJAY or National Health Protection Scheme is a fully eligibility based scheme, so there is no need to apply online. There are no online application forms or registration being made for the scheme. 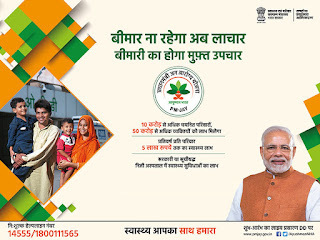 The eligibility criteria for Ayushman Bharat Yojana can be checked by calling the helpline number at 14555 or by visiting the official website of National Health Protection Scheme at mera.pmjay.gov.in.